Wealthfront became the largest and fastest-growing software-based financial advisor—with over $700 million in assets under management— by providing a simple, automated service for managing your long-term investments. Wealthfront monitors your investments for opportunities to rebalance your portfolio and harvest tax losses every day so you don’t have to. 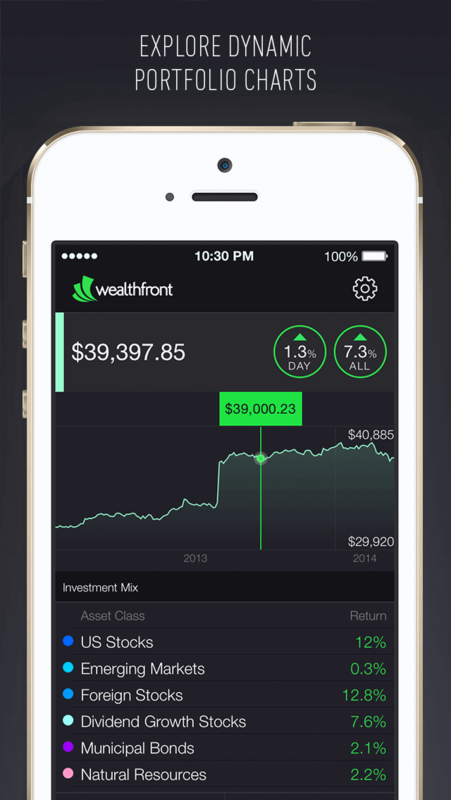 Unlike most investment applications for the iPhone, Wealthfront decided to design, from the ground up, a way for our clients to see how their investments are being managed, anytime, from their iPhone. 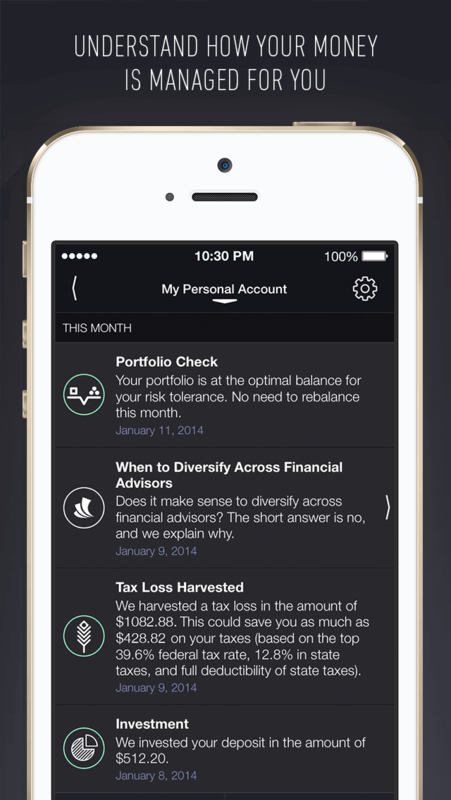 The Wealthfront application is structured around a feed of updates about your accounts. Most of our clients appreciate that Wealthfront can be their “set it and forget it,” automated investment service. They know that Wealthfront’s software is constantly monitoring their account, making sure it’s fully diversified and rebalanced. Nonetheless, many clients enjoy logging in to their accounts, to see how their money is being managed. Over 50% of Wealthfront clients logged into their accounts last week to check-in on their portfolios. Wealthfront monitors your money daily so you don’t have to, and the mobile news feed gives you a clear idea of everything Wealthfront has done to manage your account. The feed will also contain relevant, data-driven and actionable advice from the popular Wealthfront blog, to help inform and educate Wealthfront clients. 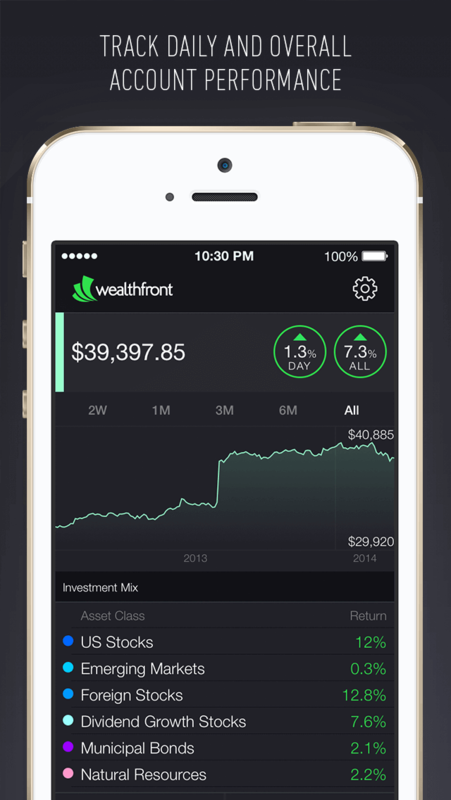 Now, all the Wealthfront news you were looking for is available anytime, from your pocket. 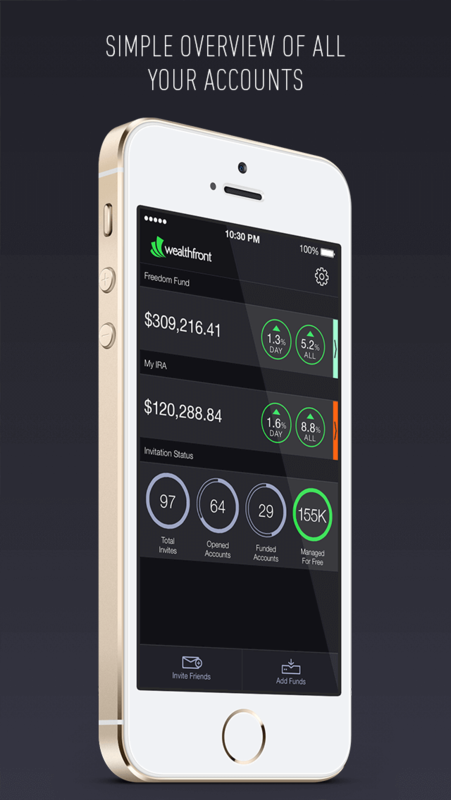 The Wealthfront for iPhone application has been designed for iOS 7 to give you a clear view of all your accounts at Wealthfront. For the first time you can see your rolled-over IRA accounts from old employers, Roth IRAs, and taxable accounts, all in one place. We took the opportunity with this release to reimagine the way our clients can explore their accounts and investment performance. You can touch and explore each chart and table for additional information about your investments, and how they have performed over time. The Wealthfront team is incredibly passionate about the future of mobile for enabling our clients to engage with us anytime and any place. We’re excited to hear your feedback and feature requests following this first release, and we will be working relentlessly to improve our mobile experience.